Complete the Graduate Admissions application with the UM Graduate School to take your next step. Ole Miss can take you further. Our 100% online master’s and specialist degrees can be completed in 18-to-24 months and are designed to help you grow as a professional. With part-time degree paths, you can balance your studies with your already busy schedule. With thousands of alumni across the state and nation, our graduates are a community of professionals dedicated to making real and positive change in education—from the pre-K classrooms to higher education. There’s a new route to teaching. Our Online M.A.in Teaching (MAT) degree is an alternate-route certification program for bachelor’s degree holders who want to teach grades 7-12. Our coursework focuses on building a pedagogical foundation for candidates with strong content knowledge—people like you. MAT candidates can teach math, science, English or social studies, and more. 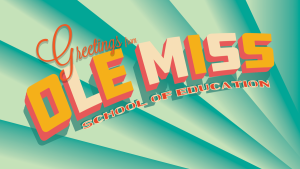 After your first semester, you can be certified to teach in Mississippi public schools and earn an advanced license after two years. Licensed teachers can also enroll to earn advanced licensure in secondary education. You can apply (and be accepted) to the program before taking Praxis exams. You must pass all of the Praxis requirements before beginning coursework. Take your job in higher education to the next level. Our Online M.A. degree is designed for a wide range of college and university professionals. Our multi-disciplinary curriculum prepares graduates to excel in student services, human resources, finance, law and more. The Online M.A. delivers the same coursework as our face-to-face program, which has served college administrators for decades. Don’t just earn your master’s—become a Master Teacher. Our Online M.Ed. degree helps educators like you utilize the best practices and latest research related to the education of children in grades K-6. Our flexible program is designed so you can pursue your master’s without having to leave work or commute long distances. If you already hold a Mississippi teaching license, you will have the opportunity to earn a Pre-K license endorsement from the state. Quality Pre-K educators make a lifelong impact on children. Can you? Our Online M.Ed. degree helps teachers, administrators and others utilize the best practices and latest research related to the cognitive, social and emotional development of young children. If you already hold a Mississippi teaching license, you will have the opportunity to earn a Pre-K license endorsement from the state. We see leadership potential in you. Take your career to the next level with our certification program in K-12 Educational Leadership. Our research-based program focuses on best practices of effective school leaders and offers collaborative, transformative internship opportunities no matter where you are. We have the state’s highest first-time pass rate on the School Leaders Licensure Exam. Our program will be a challenging and transformative investment into your career. The Ed.S. in Counselor Education with emphasis in Play Therapy is an online program where you can complete the training and experience hours required to obtain the RPT (Registered Play Therapist) credential in one year. Play Therapy is a rapidly growing field among a wide range of mental health professions and our Online Ed.S. is the only degree of its kind and brings together mental health clinicians (counselors, clinical social workers, psychologists, psychiatrists and more). In this program you will study alongside mental health professionals across the nation and graduate in approximately one year. Are you ready? It’s time to go further. We are accredited by the Council for the Accreditation of Educator Preparation (CAEP), previously known as the National Council for Accreditation of Teacher Education (NCATE).